﻿ Is Isco the true heir to Ronaldo's throne at the Bernabéu? 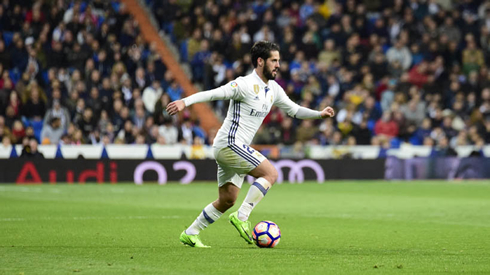 18.10.2017 » Is Isco the true heir to Ronaldo's throne at the Bernabéu? There is still plenty of life left in Cristiano Ronaldo but the Portuguese wizard is now 32 years old and many Real Madrid fans are starting to look to the future. Gareth Bale has long been touted as the man to eventually succeed CR7, but isn't Isco more of a worthy contender? Few would dare to argue with the statement that Real Madrid aren't exactly short on talent. The impressive rise of Marco Asensio alongside holding midfielder Casemiro certainly hints at the prospect of a bright future at the Santiago Bernabéu. Cristiano Ronaldo is still the man who steals the headlines season after season since his arrival to the Spanish capital, however, and his recent double in the UEFA Champions League made it 110 goals in the competition, the Portuguese maestro is showing a few signs of slowing down. Inevitably, Ronaldo's influence on the team will eventually begin to diminish and there are many contenders who will hope to step up and fill the void left by the footballing icon. Gareth Bale has long been seen as a natural replacement and the Welshman certainly has talent in abundance, but his constant struggle to remain fit may hold him back. Isco appears to be more suited to the role and the 25-year-old is still young enough to develop further. He's had a breakthrough 2017 and his statistics continue to impress European football fans. He's either assisted or scored 19 goals for the La Liga side in his last 26 starts and he also bagged a brace against Espanyol on October 1. 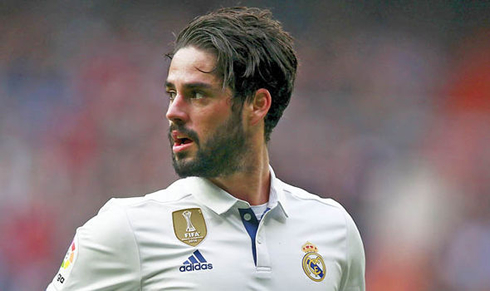 Boss Zinedine Zidane was full of praise for his playmaker after the game, saying "he knows now that he is important but he always has been", before later adding, "I hope we can see an even better Isco". Playing in a more central role this season, he has linked up with Ronaldo to devastating effect and whilst he is extremely unlikely to ever better his team-mate's record, he is no longer just a bit-part player and has put himself in pole position to succeed the Portuguese star. Isco was voted UEFA's Golden Boy back in 2012 and was courted by Manchester City before eventually opting to sign for Los Blancos. He made his first appearance in a Real Madrid shirt in August 2013. He has been a joy to watch during his short career and many pundits believe he will only continue to improve. He hasn't featured as regularly as he would have liked in the Champions League, but is off the mark in the competition after finding the net against rivals Atletico Madrid during last season's fruitful campaign. It's no surprise to see Zidane's men backed for glory in the competition once again, with Real Madrid odds of 4/1 available with Betsson for a third successive triumph in the elite knock-out tournament. Isco has a tremendous energy and his reading of the game is simply superb. Since he's broken into the side, his contributions have proved invaluable and he has a bright future at the Bernabéu. He's developed an understanding with Cristiano Ronaldo which has seen the pair contribute to copious goals so far this campaign. CR7 still has plenty to give in the Spanish capital, but when he eventually leaves, it's likely that Isco will be the man to succeed the Portuguese superstar. Cristiano Ronaldo next game is for Real Madrid on October 22 of 2017 against Eibar. You can watch Juventus live stream, Real Madrid vs Eibar, AC Milan vs AEK Athens, Everton vs Olympique Lyon, FK Crvena Zvezda vs Arsenal, and Nice vs Lazio, all matches provided from our live sports game pages.